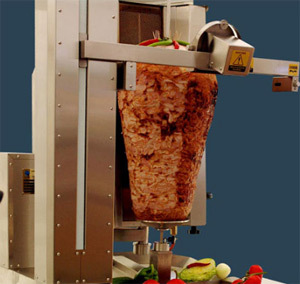 A Turkish Cypriot has unveiled what represents the cutting edge of death wrapped in pitta bread tech: the automated doner kebab meat slicing robot, capable of delivering vast quantities of perfectly-hewn nourishment. The FFDR-V1004 is the brainchild of 34-year-old Ahmet Kalyoncu, whose Döner Robotu operation is set to revolutionise a German market in which kebab shop owners each year lovingly prepare 400 million post-Bierkeller face-fillers. Kalyoncu presented his FFDR-V1004 to the world's first kebab trade fair, held in Berlin over the weekend. He proudly told Agence France-Presse the machine represents "the first kebab robot anywhere in the world", but insisted it wouldn't threaten the livelihoods of the estimated 74,000 people who work in the country's 15,000 kebab shops. Given that the deadly effects of the doner kebab are well documented, we at El Reg doubt that removing the Turkish sweat ingredient will do much to improve punters' life expectancy, but since the machine can dispense "as many as 120 portions of kebab in an hour", it should do much cut the critical waiting time between staggering into the establishment and getting your laughing gear round a lethal dose of salt and saturated fat.